French toast is a classic. 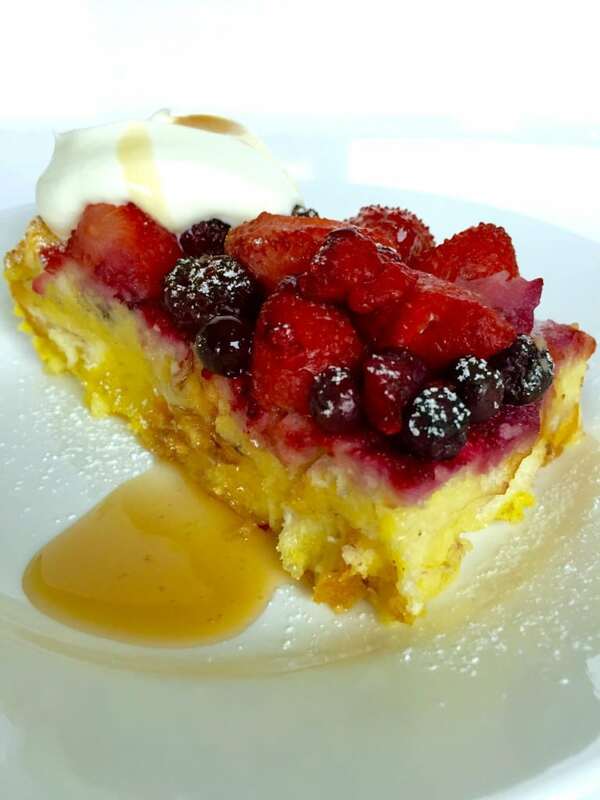 Baked French Toast is a classic, reinvented. 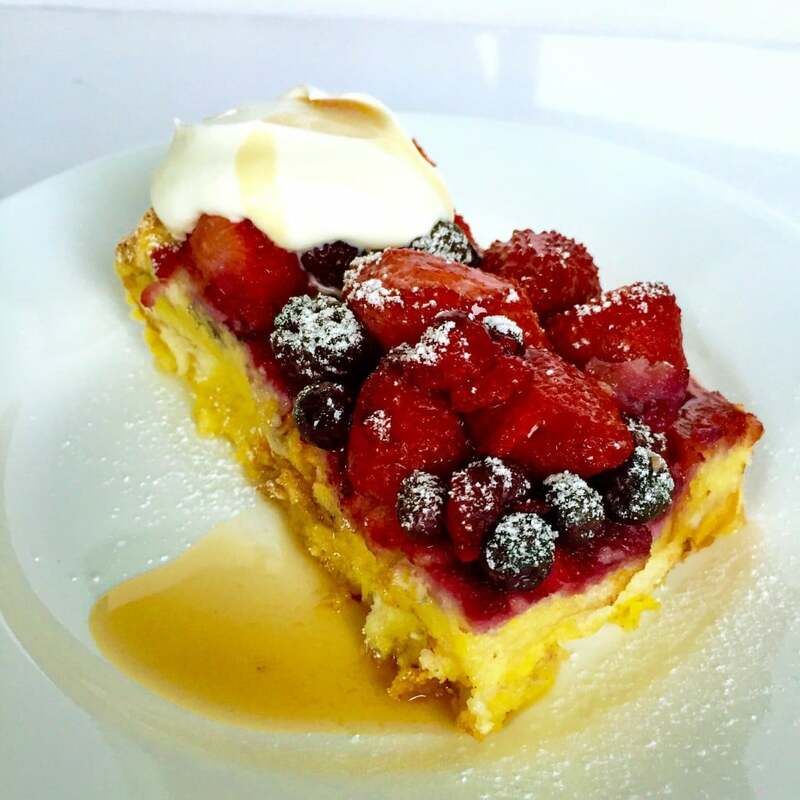 Layers of pudding-like bread baked with berries to a perfectly delectable finish. Top it with maple syrup if you like. Or sprinkle on some chocolate chips. Go on. Don’t be bashful. It’ll be our delicious little secret. 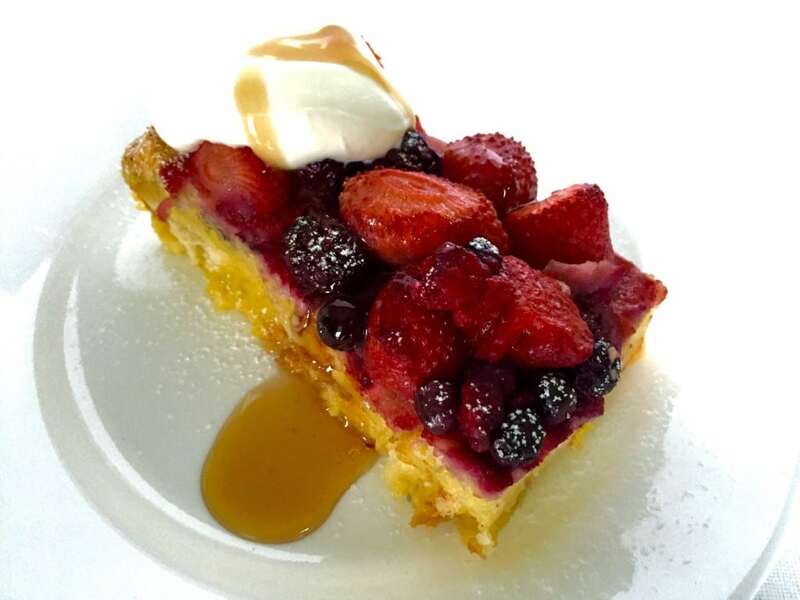 And if you need another excuse to make this Baked French Toast recipe, Valentine’s Day is around the corner. It’s on a Sunday this year. (Also, Family Day on the Monday for all you Canadians.) Make this for your partner/husband/wife/boyfriend/girlfriend/cat. They will love you all the more for it. And in case you’ve missed Valentine’s Day, this is a wonderful way to get back in their good books! My Nutella & Dark Chocolate French Toast recipe is a good option too. And if they’re still mad at you, my Croissant French Toast is sure to melt (or clog!) their heart. Onwards! Now, I know a lot of people who dilute the deliciousness of French toast saying that they want to make it that tad bit healthier. Well, I say that madness must end! Allow yourself to bask in one of life’s great indulgences. Suffice to say, this baked French toast recipe is not designed to be healthy. In fact, with every bite you’ll probably shorten your lifespan by about a day and a half. But at the end, you’ll know it was totally worth it! Disclaimer: This Baked French Toast recipe doesn’t really shorten your lifespan by several days. That would be silly. And dangerous. And not at all groovy. I’m just telling you not to be stingy with the cream! Do you know what the French call French toast? It’s not just ‘toast’. ‘French toast’ in French is actually ‘pain perdu’, or ‘lost bread’. I think there’s something poetic about that. I feel like it would be a good title for a book. Authors — kindly thank me in your acknowledgements. And feel free to send me royalties. Please and thank you. If you need to reach me, Facebook, Twitter, Instagram, Pinterest, and Tumblr are all easy places to find me. Or just subscribe via the email subscription option at the bottom of the page. Or just leave me a comment below. Or do all the things! You should! You should do all the things! 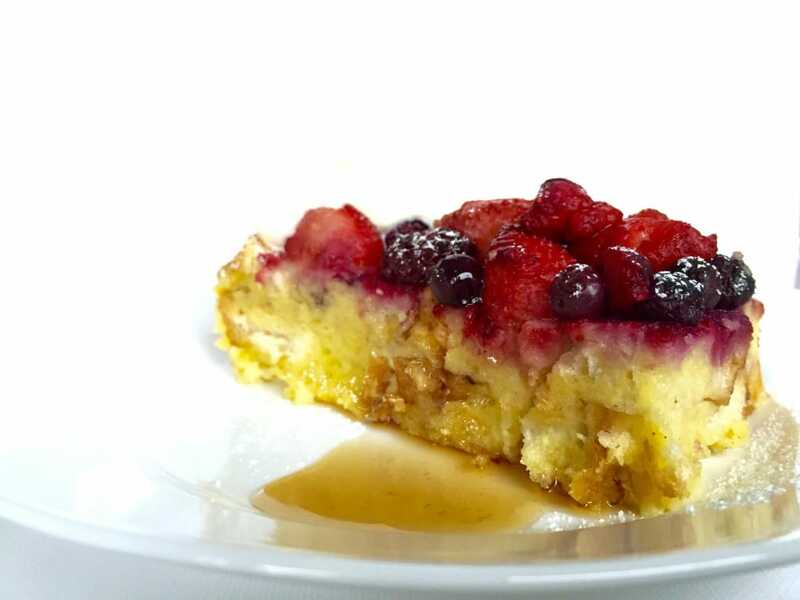 Learn to make this delicious Baked French Toast recipe – easy, breezy, but so tasty! Grease baking dish with butter. Toss your crostini (or bread bits) into dish. Mix all the remaining ingredients (except for the mixed berries and icing sugar) together. Pour evenly over the bread. Cover with cling film, and refrigerate for two hours (ideally overnight). 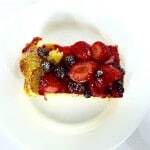 When ready to bake, spread mixed berries over the top of the bread mixture. Bake for 40–50 minutes.If you prefer your French toast on the crispier side, let it bake in the oven for an additional 10–15 minutes. Finish with a dusting of icing sugar, a drizzle of maple syrup, and a dollop of whipped cream. Oh wow, I have to try this! I don’t think we will be waiting until Valentine’s Day either! 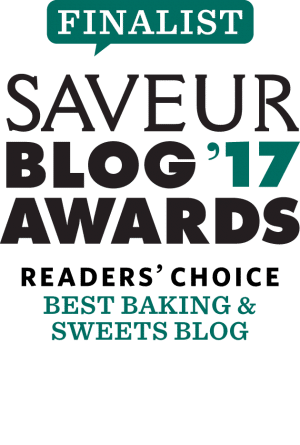 I have never made a baked french toast recipe before, am definitely adding this to my To Do list! Hope you enjoy it! It’s like having cake for breakfast! Isn’t this bread and butter pudding, Rizwan? Baked French Toast, now that is a good idea. I went foraging on the weekend for blueberries which will work perfectly with your recipe. Cant wait! Yarm! That sounds amazing! Make sure to post a pic! Drooling!!! If you have the patience to take so many pictures and the write about it instead of attacking it right away… you must be GOD! Hah! Holding myself back from digging in is the HARDEST part of blogging. No question! 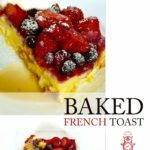 Very good baked french toast recipe, I would like to have a try today! Thanks KD! Glad you liked it! wow awesome … i loved it! Glad you enjoyed it Vishal! Nice recipe. My mom used to do something similar. A beautiful and tasty dish for a special brunch . . . or any day! Thank you for passing by, Elaine! I agree…this is good for Sunday brunch or any other day! Yas! This wins all the prizes. Oh my gosh, your photos have me drooling over my computer! Definitely giving this a try soon. LOL! Thanks so much Jo! I hope you enjoy it! I haven’t had a baked french toast in years and this is definitely calling my name! Thanks for sharing! OH! So *THAT’S* why my breakfast kept calling me Lizzy. Makes much more sense now.